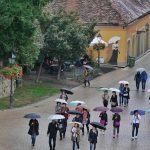 It’s day six in Zagreb, and all of them have been filled with four things — sickness, fatigue, rain, and wine. And some photography, some of which I’ll share here, but more of which you could also find on Instagram and Facebook. Rain is battering the street below as a cacophony of tourists’ babbling carries up to my window. I’m sitting in pajamas that can use a wash but the AirBNB’s machine is broken and I have to go on a trek to a laundromat tomorrow to contend with my everything-is-dirty life (but my host says he’ll repay me in cash, which is nice of him, and that the machine will be fixed soon). 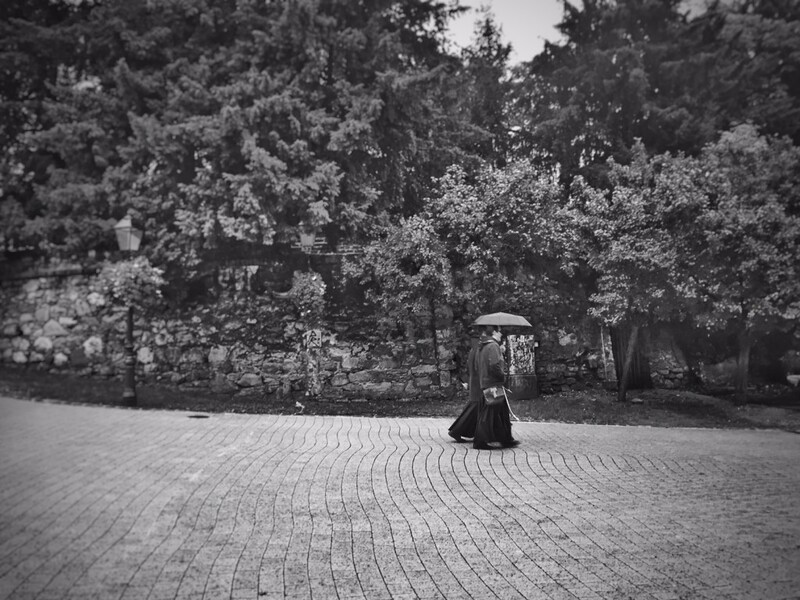 I believe these are Jesuit monks, some of the many Catholic clergy I seem to see everywhere in Zagreb. Part of me expected to get sick. I was due. One doesn’t push the pedal to the metal for two-plus years and not eventually have a collapse. I planned three weeks here just in case I did get sick. Self-fulfilling prophecy? Not really. It’s the reality of what going from “hectic” to “totally slow” does to a person. With no need for the adrenaline that fuels a frantic life, the body is thrown in disarray. I’ve been sad all day, though, because I had the good fortune to be invited to exactly the kind of thing I dreamed I’d experience on my travels — helping harvest olives. In these “old world” places, and even in new world wine regions like the ones at home, harvest time is when you pull together kindred spirits, friends, and family, and knuckle down for a weekend of work. Everyone shows up, works hard, and they get fed incredible food and wonderful wine. It’s work but also laughter and camaraderie, and it’s certainly not what your average tourist enjoys. On one walk, I saw this really excellent street art on a little side lane. 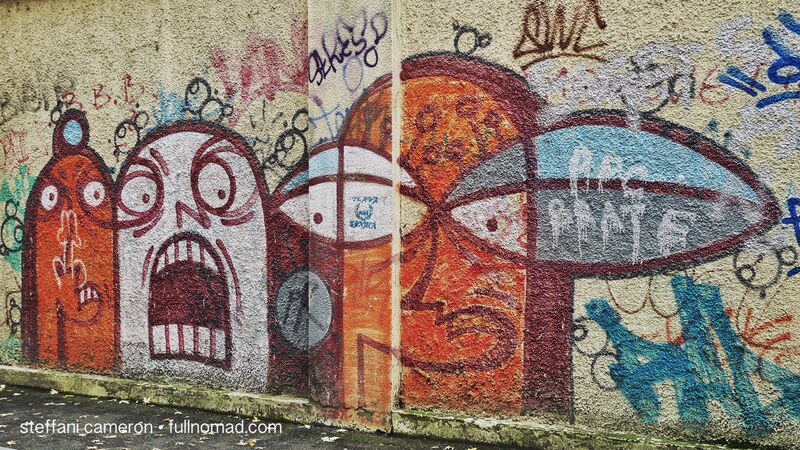 Get off the main roads and don’t underestimate graffiti! But I can’t do that. I can’t take the risk of getting out there this week when I’m still a disgusting snotball and working to others’ schedules. I need naps, my sleep is still erratic from jet-lag, and my “vacation” is over Sunday, meaning I return to a life of work daily — with a new version of my work program that I’ve never used before. 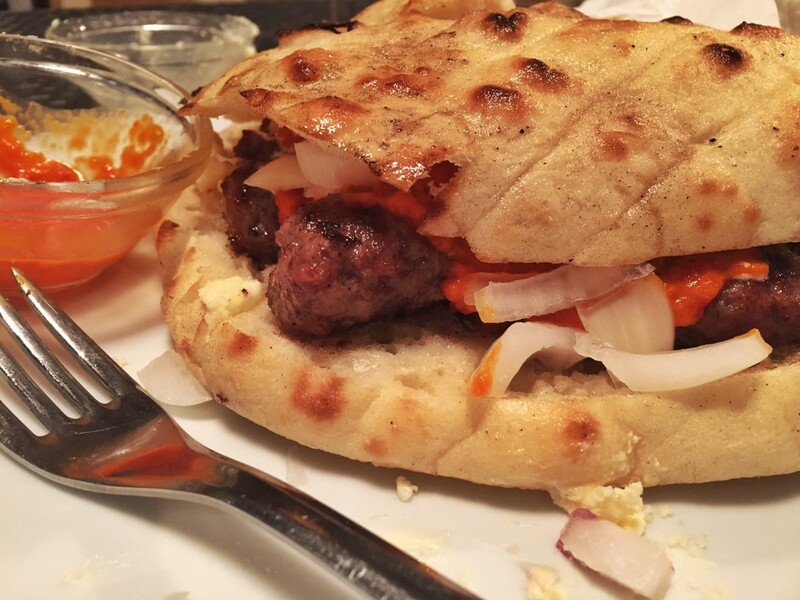 One of foodie highlights of my week was this glorious sandwich made of finger-sized rolls of Croatian beef seasoned and grilled — čevapčići has stolen my heart! Or my belly. This is the trouble with travel life, though. Getting sick means missing precious time in a location you might never see again. It means missing out on opportunities you’ve never before been offered and may never receive again. It’s another argument for slow travel — so you can have “down” days without regretting too much. 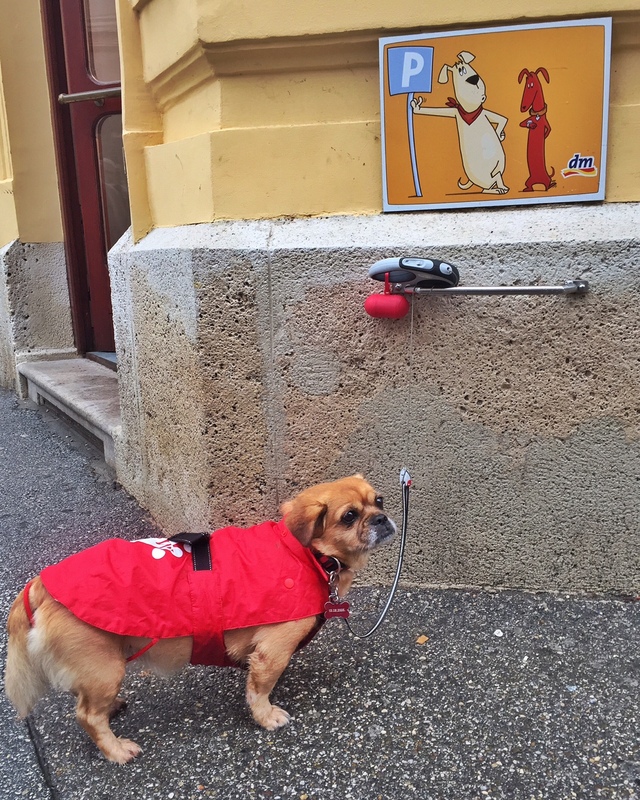 Sometimes you just gotta hang out and chill, like this little doggy in Zagreb’s adorable “doggy parking spots”. What are my options, though? Going “Oh, but I gotta do this!” and then possibly being sick even longer, having it bleed over into another location? Or do I just stop and give into what I’m experiencing, because the sooner I’m over it, the quicker I can get back to the life I want to lead? Well, yeah. That one. So, here I am, in the touristy district of Zagreb, nursing a bad cold, drinking pity wine, and eating Not Far From Home (and having some misses among the foodie hits). 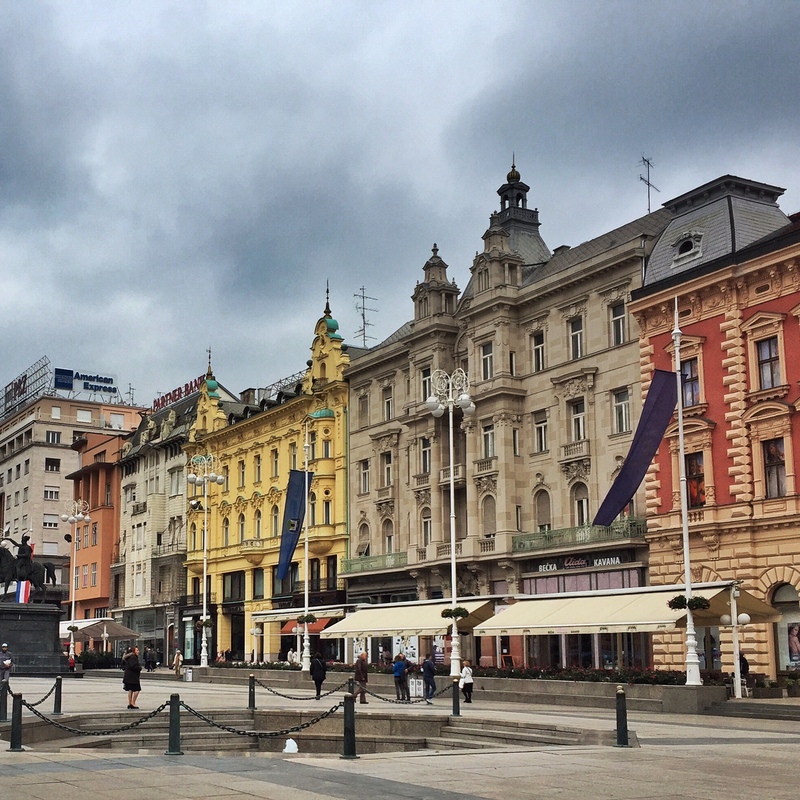 This is the heart of Zagreb for the locals — Trg Bana Jelačića — where the marathon finishline was last Sunday, where all the trains come, and so on. 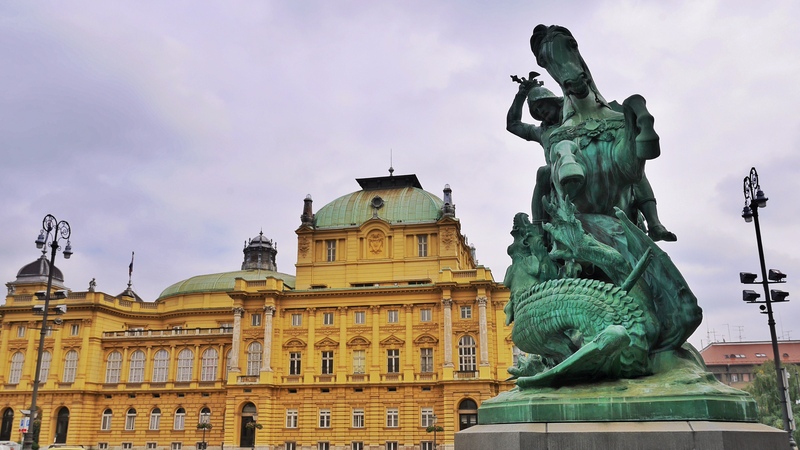 Still, I’ve seen some of Zagreb, met some people, and made some observations, so how about we change topics and talk about that? Sure! Let’s! I really like the lack of takeout here. Yeah, it exists, and people do takeout coffee and all that, but they do it way, way less. A local man seemed to get defensive when I said there was barely any takeout, but I don’t think he realizes what an atrocity takeout is back at home. I’ve seen garbage cans literally overflowing and spilling onto the streets because of Starbucks cups and fast food trash. It’s an embarrassment and environmental crime. Here, people seem much more likely to just stop and drink a cup of kava the old-school way, in a cup — with saucers, even! and pretty little spoons! — indoors or on year-round sidewalk patios. They stop, enjoy, and then go again. It’s perfectly normal to go in for just 10 minutes to drink your coffee — which is always a small cup of espresso you can get with either milk or whipping cream. This is a healthy, beautiful way to live. 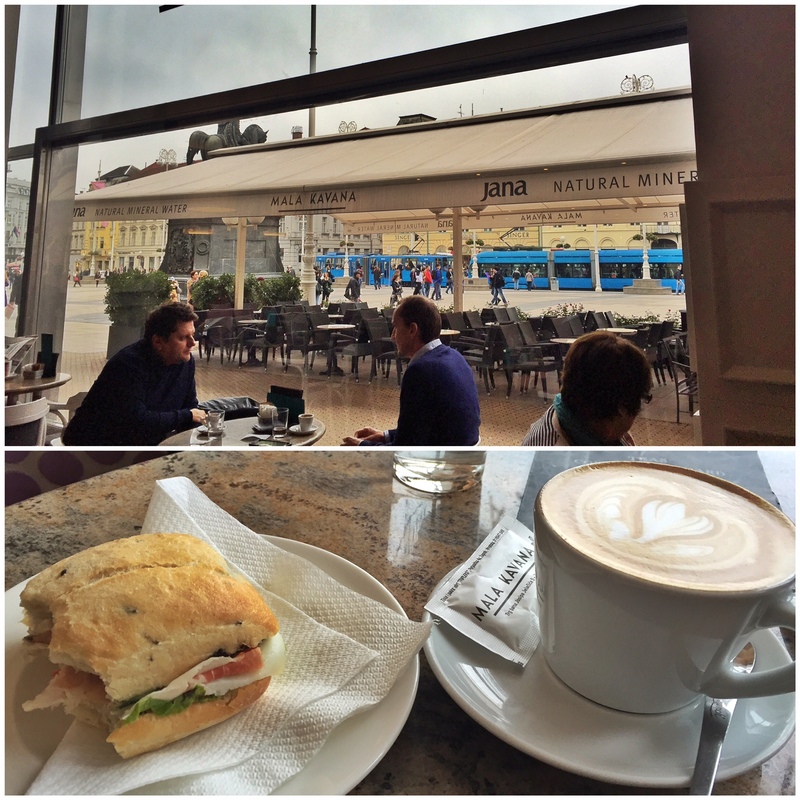 I also have seen only a handful of people eating while they walk, and likely all tourists, because locals seem to feel the same about civilized eating as they do coffee-sipping. This “kava s mlijekom” is just steamed milk with espresso, and the sandwich is a small one with prsut (think proscuitto) and cheese, but it’s under $6 Canadian. And see? People sit and talk over coffees, enjoying life. You know what I could get used to everywhere else? This Zagrebian (or is it Croatian?) tendency to price EVERYTHING you see in windows. “How much is that doggy in the window” wouldn’t even be a song in this town because you’d freakin’ well know how much the doggy is. He’s 2499 kuna! I love this transparency and I think it makes us more likely to spend money because we know we can afford the thing, rather than faking us into a store where we learn it’s out of reach, so we slink out in it’s-out-of-my-means shame. And things are affordable, too, largely because the economy is hurting here and their currency isn’t very valuable right now. This is the national theatre, where I’ll attend a 4-hour Giusseppe Verdi production for a paltry $30, with one of the best seats in the house (center of third row); at home I’d be looking at $150 for the equivalent — plus tax, likely. Do NOT walk on the outside of sidewalks. That’s the cycling lane. Even if it’s not marked, that’s where the bikes’ll be making their way. They get about 24” tops for the “bike lane” on the edge of sidewalks, and given how hairy traffic can be here, like in all European cities, that’s a bit of a daunting prospect. Sure makes me laugh at the indignity expressed by pedestrians back home who think cyclists of any speed or style on the sidewalks are just a hair’s width from killing everyone. 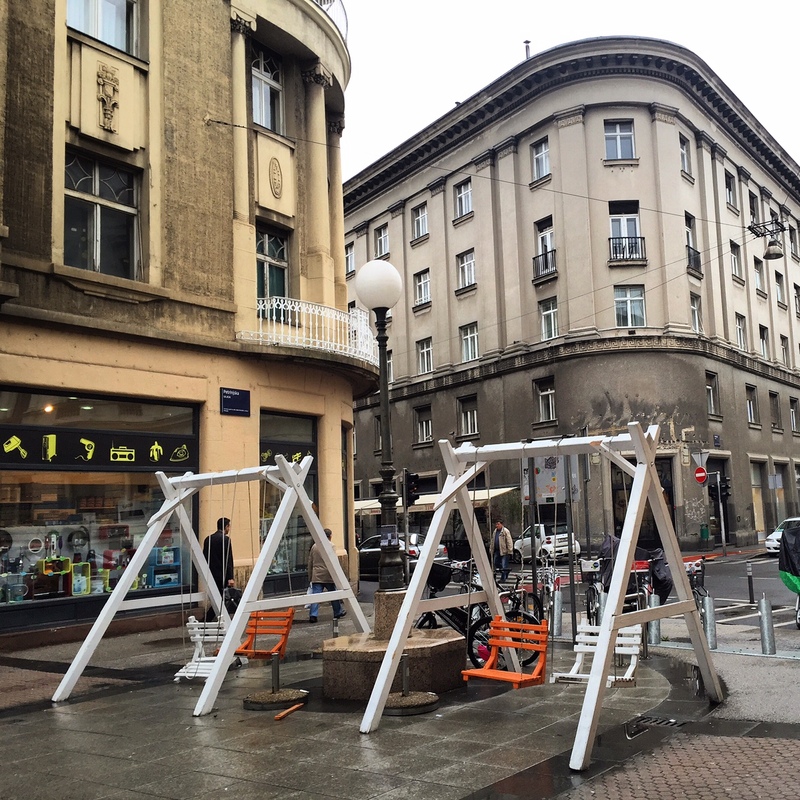 But that’s okay, pedestrians get cool stuff like this — swings in the city! Busted on the left but I’m pretty sure it’ll get fixed soon. Some sunny day, I’m going back. I’ll stop there, but there will be way more observations after I’ve been here awhile. So far, I’m really enjoying the little I’ve seen of this city and I look forward to sharing more with you. I’m a ‘traveler’ in quotations who is too timid to travel on my own. I’m in my sixties and feel more comfortable on tours, especially when I can’t speak the language. I admire your gumption and realize you’ll have way more interesting interactions than I have. Maybe if I had started earlier….. . I’m thoroughly enjoying your blog, even the grumpy bits. Life wouldn’t be life without the grumpy bits too. You sound like a wonderful person. Grumpy is just part of life, and I’ve had a lot to be grumpy about since I got here, and yet I’m really enjoying it too. This is life, right? I think I’m lucky that I’m just young enough (42) to be hip to all the new technology that makes travelling alone so much easier — GPS on your phone makes it easy to follow where you are on a map in real time, even without WiFi or data if you have the Ulmon City Maps2Go app or something similar. There are translation tools, I can google for information on just about anything, and all that. It’s a very different travel experience from even just 10 years ago!